A few years ago I was watching some Jeffrey Dahmer interviews and I was absolutely shocked by how many women were so attracted to him, made excuses for him and in many cases showed anger to people who didn't like him. (Before the internet the vibe/expectation was how horrifying it was that he was so matter of fact in the way he described the crimes.) And today I read about all the fan mail that Nikolas Cruz has been getting from teenage girls who support him. Could the Zetas say anything about the mentality of these girls? Perhaps it's similar to what they've have said about those weak minded people who joined and admired Isis. And are a large number of people susceptible to this, or just really weak minded people. This might lead to more STS to commit mass murder. "To the extent that the rebellious Puppets are the political power in a country, that country may find itself fiscally undermined and corruption within that power structure exposed. To the extent that the rebellious Puppets are corporate heads, those corporate heads will find themselves unable to get the loans they need to continue, and forced into bankruptcy court. To the extent that a Puppet Master, and there are many, senses that the enemy is another Puppet Master, the property holdings of that Master will be undermined, whether this includes a country, a corporation, or financial holdings such as bonds. Watch closely, during this war of the titans in the financial realm, and you will see the swords flash and parry." Relations between countries are getting worse. The US introduces duties on goods for China and the EU. The EU and China promise to respond symmetrically. Inside the EU, disagreements are raging. Inside the North American continent too. This is already called a trade war! The war between the Puppet Masters is unfolding? The policy of protectionism is gaining momentum. 2) Now we go down to the puppets. "If you were king, and feared being deposed, would you surround yourself with the weak or the strong? We are not speaking here of integrity, the good king surrounding himself with the noble knights, we are speaking here of the real world where money is to be made, control of minions to be secured, and all for a well crafted plan. There may be strong among them, but they are well down the ladder, as those around the king are as incapable of assuming leadership and deposing the king as a drug addict is of defying his dealer and forgoing his fix. Those surrounding the king were chosen for their weaknesses, and their inability to deal effectively with those weaknesses." Is it true that most of the high-ranking positions in the countries/corporations/banks of the world are occupied by weak personalities? If you look at history, you will see that the same Putin came to power, solely thanks to the PR of the then acting government (Yeltsin - who has the reputation of an inadequate person). Although we see Putin who opposes the West as a hero. This is certainly not the case, inside the country, Putin is not effective. Just the interests of the elite of Russia and the government coincided. The recent elections in Russia have shown the power of the media. A week before the election, 3 documentary films about Putin were published! The remaining candidates participated in the format of "disgusting debates". Who is Trump? Billionaire, showman, etc. Is such a person worthy to hold the office of president (to imagine an ideal situation)? Surely, no. A few years ago I was watching some Jeffrey Dahmer interviews and I was absolutely shocked by how many women were so attracted to him, made excuses for him and in many cases showed anger to people who didn't like him. (Before the internet the vibe/expectation was how horrifying it was that he was so matter of fact in the way he described the crimes.) And today I read about all the fan mail that Nikolas Cruz has been getting from teenage girls who support him. Could the Zetas say anything about the mentality of these girls? Perhaps it's similar to what they've have said about those weak minded people who joined and admired Isis. And are a large number of people susceptible to this, or just really weak minded people. This might lead to more STS to commit mass murder. The trend, especially among women, to desire the tough guy as a mate is not new. It has as a basis mankind’s cave man past, where the brute could keep the tribe safe and hunt with success. It has an equivalent among young men, who desire to join a gang, and the worse the reputation of the gang, the better. Ruthless, so that those who would oppose them step aside and give them no challenge. This has the equivalent in the corporate world, where job seekers hope to be respected by association. A failing company seldom gets this enthusiasm. Certainly the military has this image, strength by association. Is the psychopath, like Jeffrey Dahmer or Nikolas Cruz, any different? They are not strong, or tough, as their early life shows. They picked on the weak, torturing and dissecting living animals as children. Their victims were smaller and weaker than they, or not armed. They only appear strong because they show no remorse in court for the pain and death they caused. It is the lack of emotion or remorse that gives a false illusion of strength. ISIS has the same persona, setting prisoners on fire, for instance. When they brag about taking territory, they appear strong, a false illusion. Relations between countries are getting worse. The US introduces duties on goods for China and the EU. The EU and China promise to respond symmetrically. Inside the EU, disagreements are raging. Inside the North American continent too. This is already called a trade war! The war between the Puppet Masters is unfolding? The policy of protectionism is gaining momentum. China warns it will 'fight to the end' in a trade war. A way of buying and selling products that makes certain that the people who produce the goods receive a fair price. Trade wars and treaties have been used for eons to reward or punish another country for their cooperation or abuses. The true reality is seldom what is seen on the surface, as this has little to do with fair trade or price stabilization or encouraging industry to develop. The controlling hands in these matters are almost always the wealthy, in the form of corporations who stand to benefit. This is true regardless of the prevailing religion or ideology in the country. Where an industry flourishes or is headquartered matters, and where the wealthy receive favorable treatment also matters. Under President Trump’s Junta the US appears to have gone into an isolationist stance. The Paris Accord was rejected by Trump, despite howls from Europe and Global warming advocates. NATO members have been told to shoulder their fair share of the cost. Russia has been accused of poisoning their former spies living in the UK, despite the obvious evidence that the UK itself did this poisoning, and now diplomats on all sides are being expelled. The US is building a wall between itself and Mexico, and Trump threatens to reject or amend former trade treaties. What is driving these changing circumstances is the awareness that the public is on the verge of realizing that Nibiru is real and rapidly approaching for a passage. Panic and migration is anticipated to explode. Banking failures, regardless of what banking network is in charge, will occur with the wealthy suddenly finding their holdings worthless. The citizenry will either be led to be self-sufficient and grow strong in the Aftertime or degenerate into starvation and chaos, as Venezuela is today. There are opportunists, like the Soros network, who are trying to sow chaos as they hope to seize power during the confusion. The US under Trump’s Junta is trying to strengthen its military and borders with the Pole Shift and Aftertime in mind. Rather than cooperate with the cover-up, they have rejected the Paris Accord, and seek to make US industry independent from other countries. Russia has led in this regard, establishing a new Russia in its Far East and partnering with China, and frankly sees any spitting contest over diplomats as no more important than a sneeze. China is very self sufficient and immensely powerful among all countries, its role in the recently tamed N Korea has yet to be known by the public. Europe has yet to adapt and prepare. To the extent that the rebellious Puppets are the political power in a country, that country may find itself fiscally undermined and corruption within that power structure exposed. To the extent that the rebellious Puppets are corporate heads, those corporate heads will find themselves unable to get the loans they need to continue, and forced into bankruptcy court. To the extent that a Puppet Master, and there are many, senses that the enemy is another Puppet Master, the property holdings of that Master will be undermined, whether this includes a country, a corporation, or financial holdings such as bonds. Watch closely, during this war of the titans in the financial realm, and you will see the swords flash and parry. Is it true that most of the high-ranking positions in the countries/corporations/banks of the world are occupied by weak personalities? If you look at history, you will see that the same Putin came to power, solely thanks to the PR of the then acting government (Yeltsin - who has the reputation of an inadequate person). Although we see Putin who opposes the West as a hero. This is certainly not the case, inside the country, Putin is not effective. Just the interests of the elite of Russia and the government coincided. The recent elections in Russia have shown the power of the media. A week before the election, 3 documentary films about Putin were published! The remaining candidates participated in the format of "disgusting debates". Who is Trump? Billionaire, showman, etc. Is such a person worthy to hold the office of president (to imagine an ideal situation)? Surely, no. We have stated that since the Fall of 2015, when Jade Helm ended without Obama informing the people that Nibiru was a real and present danger, that the US has been under a form of martial law, run by a Junta. Trump inherited this setup, and has an excellent working relationship with the Junta. It has been said that a King only has power if the military supports him, and this is certainly true in China and Russia, though in both those countries the military is a partner, not a boss. China is very consensus oriented, run by committees, but Xi is very much its leader, as the vote to remove term limits shows. Putin has immense popularity, and is seen by all as a stable leader with the welfare of his country his top priority. as her secret militia and partnering with Erdogan in Turkey. The new Saudi King shows new promise for leadership in the Middle East, showing that change can be transformative. If you were king, and feared being deposed, would you surround yourself with the weak or the strong? We are not speaking here of integrity, the good king surrounding himself with the noble knights, we are speaking here of the real world where money is to be made, control of minions to be secured, and all for a well-crafted plan. There may be strong among them, but they are well down the ladder, as those around the king are as incapable of assuming leadership and deposing the king as a drug addict is of defying his dealer and forgoing his fix. Those surrounding the king were chosen for their weaknesses, and their inability to deal effectively with those weaknesses. Nancy, a strange light display recently appeared in China with a large geometric design and at the 4 o'clock position another smaller light. Could this be a UFO warning, and if so what is the message? Thank you. Nancy, a strange light display recently appeared in China with a large geometric design and at the 4 o'clock position another smaller light. Could this be a UFO warning, and if so what is the message? And this footage we see a huge hexagon shaped object next to the ISS but if you think that’s it watch closely around the 2 min mark as another UFO comes into view for a very short time. No. 8 has long been regarded as the luckiest number in Chinese culture. With pronunciation of 'Ba' in Chinese, no. 8 sounds similar to the word 'Fa', which means to make a fortune. It contains meanings of prosperity, success and high social status too, so all business men favor it very much. What is the significance of an octagonal UFO seen over a Chinese city? On March 15, 2018 a hexagon UFO was filmed next to the ISS. A hexagon UFO was also present next to the ISS in February, 2015. Distinct geometric shapes, especially where displayed where they will be recorded on film, are used to convey a message to a broad audience, as they are rare and undeniable. The ISS has sleeping quarters for 6, though it can for a short time host more astronauts. The hexagon UFOs that have visited the ISS are telepathically warning those aboard that they are in danger from the debris in the tail of Nibiru. For the Chinese, 8 is the most lucky number. It represents prosperity and success. We have recently mentioned that China’s role in intervening in the N Korea crisis is not yet known by the world. The resolution of this nuclear threat, amid the burgeoning confrontation between Kim and Trump, was not due to Kim suddenly becoming realistic or intimidated by Trump. When the world learns of China’s full role, China’s status in the world will rise. Where the US dollar has always been considered the stable and reliable currency, the yuan is overtaking it. This UFO display is congratulating China. Until recently, China was the most successful economy in the world. A record number of people are excluded from poverty, the fastest GDP growth in the world, etc. But the banking system wants to spoil and this! It's curious that now the 4 largest (or one of largest) banks of world are located in China. "Economic miracles are those that enrich the rich, and enslave the poor and middle class in debt." Now China is facing a slowdown in economic growth and a demographic problem (the settlement is getting old). China recently admitted that it falsified many of the economic indicators. It's known that in times of economic turmoil, the government is trying to increase control over the population. (As in Germany in the 30's and 40's) But this is just a guess. Why do China introduce Social Credit System (SCS)? Of course in China there have always been severe laws, but the fact that they become even worse speaks of a negative trend. <...> So just how are people rated? Individuals on Sesame Credit are measured by a score ranging between 350 and 950 points. Alibaba does not divulge the "complex algorithm" it uses to calculate the number but they do reveal the five factors taken into account. The first is credit history. For example, does the citizen pay their electricity or phone bill on time? Next is fulfilment capacity, which it defines in its guidelines as "a user's ability to fulfil his/her contract obligations". The third factor is personal characteristics, verifying personal information such as someone's mobile phone number and address. But the fourth category, behaviour and preference, is where it gets interesting. The announcements offer a glimpse into Beijing's ambitious attempt to create a Social Credit System (SCS) by 2020 — that is, a proposed national system designed to value and engineer better individual behaviour by establishing the scores of 1.4 billion citizens and "awarding the trustworthy" and "punishing the disobedient". Liu Hu, a 43-year-old journalist who lives in China's Chongqing municipality, told the ABC he was "dumbstruck" to find himself caught up in the system and banned by airlines when he tried to book a flight last year. Hi Nancy, we had a fleet of UFOs sending a message in Michigan on Sunday, April 1, 2018. Michigan is at the end of the St. Lawrence Seaway, which per ZetaTalk will tear further open during the shift, and Detroit will also be distressed by earthquakes per the Zetas. Would the Zetas care to comment if this is an update on the pending New Madrid Adjustment, or if there is another message? Declined. Appears to be celebration fireworks on Easter Sunday. Note this sighting was not substantiated by anyone else. Hi Nancy, we had a fleet of UFOs sending a message in Michigan on Sunday, April 1, 2018. Declined, though as usual you have exemplary documentation, Stan. China is communist, but many trends are capitalist, which comes with the allowing the citizen more freedom, which has been the trend too. The US has individual credit ratings, depending upon how the individual pays their bills and the like. 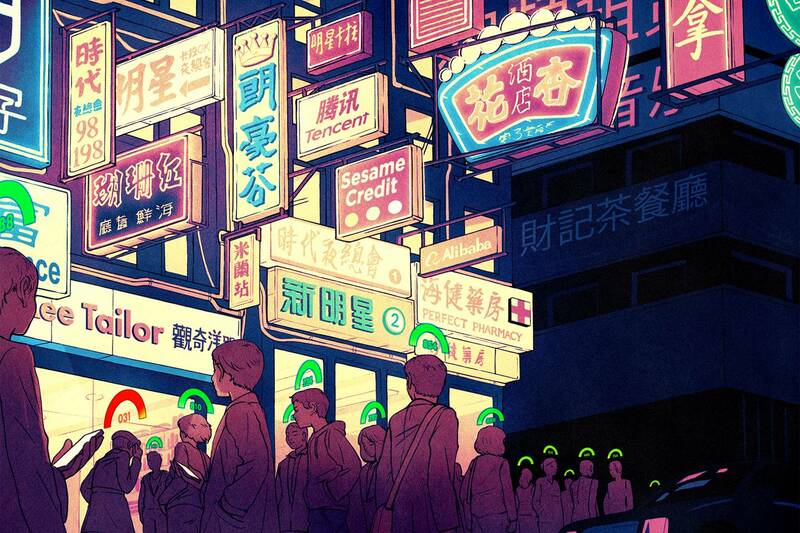 Why should it be a shock that China now has a Social Credit Score? It's the same thing! If China has now become the most wealthy country, why should it be a shock that the largest bank in the world is in China? Nor is keeping a close eye on those who travel anything odd. In the US, people are pulled aside for extra questioning if they fit into certain profiles! That's a fact, and I'm sure the US is not alone. Until recently, China was the most successful economy in the world. Could you comment on this anomaly noted on google earth in the Antarctic? I used the 72 S and 79 W to get close and then look around. Take a look around Antarctica in Google Earth.? was purportedly discovered in 2017. A space ship sized port was discovered on Google Earth in 2012. Metal was detected under the ice near the fresh water Lake Vostok in 2011, indicative of a civilization there in the past. And now a tube assembly on the very edge of the land mass of Antarctica, just under the waves in the sea level of today. In the past, this tube assembly might have been at the water’s edge. Where Lake Vostok is fresh water, it is easier to gain fresh water from a desalination process than to port fresh water over many miles. Water flows down a series of tubes, ejecting salty water at juncture points while the increasingly fresh water flows through to the end. This is not a process used by man today, which focuses on condensing steam. As we mentioned, the Annunaki and their alien contacts were both resident in Antarctica in the past. This desalination device will not be the last discovery, as Antarctica will tip out of the water as the eastern edge is lifted during plate movements.